***Welcome to M.A.C.E Martial Arts. Our Academy has something for everyone. Each of us weather we are 5yrs old or 65yrs old is a unique individual, with unique needs and desires, but you already know this. Our, and now your martial arts academy realizes that each person who enters our doors has different learning capabilities, different physical limitations as well as many other different abilities. We will take your abilities and increase them immensly thus decreasing your limitations proportionately. Remember this, your goal in martial arts is not to be the best, but to be the best that you can be. A Black belt (if that is your goal) is a white belt that never quit. We personally think of martial arts classes as a true life insurance policy, because these classes could be the difference beween life and death in a serious attack on your physical being ,that to us is a true life insurance policy, not money collected by someone else at the expense of your death. We do not condon physical violence, but it is unfortunely a growing problem in our society. Why not give yourself the ability to control a situation that may turn violent. martial arts gives you not only this ability, but also the ability to walk away from a fight. Remember, those who live by the sword die by the sword, there is always someone better around the corner. We teach an eclectic system of martial arts with our ranking being primarily in Tae-Kwon-Do. M.A.C.E. Martial Arts is an Academy that offers Mixed martial arts classes for adults in a real kickboxing ring as well as some of the most innovative self defense tactics available anywhere. Our children's classes provide self defense and martial arts classes in a upbeat safe and fun environment stressing discipline and reality involving fighting. Anti-Bullying tactics are taught as well as teaching them to beat their attacker mentally instead of using physical violence. Our instructors have trained with some of the most famous and expert martial artist in the world: Matt Serra (UFC Champion),- Renzo Gracie (Gracie Jiu jitsu-UFC champion, WEC pit bulls coach), Mark Hatmaker(Submission Wrestling expert), Eric (Chainsaw) Charles(UFC Fighter), Tandam (Barncat) McCroy (UFC Ultimate fighter) Daniel Beleza(World Brazilian Jiu jitsu Champion), Chuck Norris(P.K.A. Middleweight Karate Champion- movie star- Walker Texas Ranger) Bill (Superfoot) Wallace(P.K.A. Undefeated Middleweight Karate Champion), Joe(The Jaguar)Lewis(P.K.A Heavyweight Karate Champion-movie star- Bruce Lee's Student), Benny(The Jet) Urquidez(P.K.A.) Lightweight Karate Champion), The Late Great Grandmaster Ed Parker,(Founder of American Kenpo Karate) Dr. Jerry Beasly (Jeet-Kune-Do-Blackbelt Hall of Fame Inductee), Mike Lee Kanarek (Founder of F.I.G.H.T.- Fierce Israeli Guerrilla Hand-to-Hand Combat Tactics), Billy Blanks(Founder of Tae-Bo-movie star), The Late Great Grandmaster Bong Soo Han(Hap-Ki-Do founder-Billy Jack movie star instructor), Michael DePasquale Jr (Hollywood Stunt Coordinator-CIA-FBI instructor) George Dillman(Pressure Point Knock-out expert-Black belt Hall of Fame Inductee-Muhammid Ali associate) Perry Gibson(Muay Thai kickboxing), Willie (The Bam) Johnson(WMAC Masters Star-National Wu Shu Champion- Combat Kung Fu Instructor), Grandmaster Ken MCkenzie(Hap-Ki-Do World Record holder for Ice Breaking), and the list goes on. Visit our wall of fame at the academy. 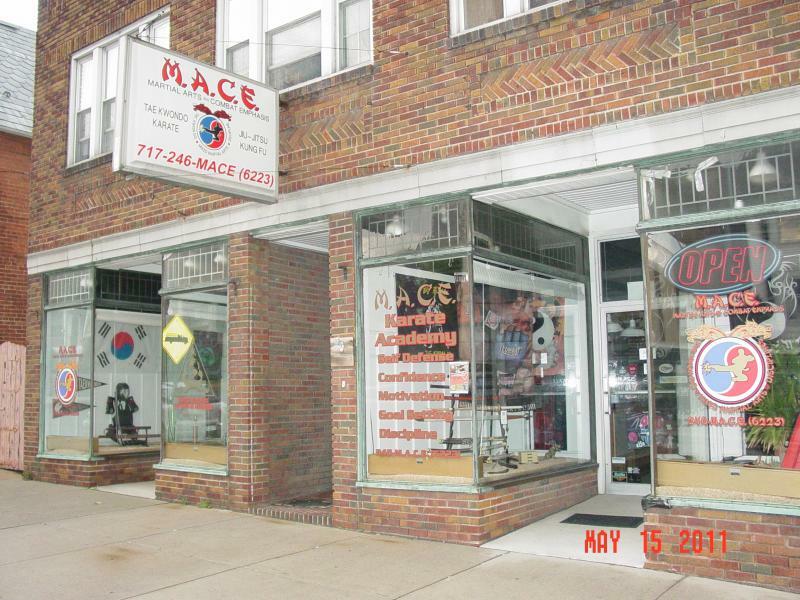 MACE Martial Arts Academy offers the most well rounded, innovative Martial arts training program in the greater York County area we have over 6000 sq feet of training space. On one floor (The fight pit) we have a boxing ring to hone your off-the-rope skills, as well as mats that line the floors and walls to work Brazilian Jiu jitsu, Submission grappling, and Wrestling, plus weight training and cardio equipment. On the street level floor we have plenty of heavy bags, speed bags, and double end bags. a large locker and dressing room. James Olewiler: Owner, Head Instructor 7th Dan Degree Black belt, Tae Kwon Do, Kickboxing, Boxing and MMA Coach. 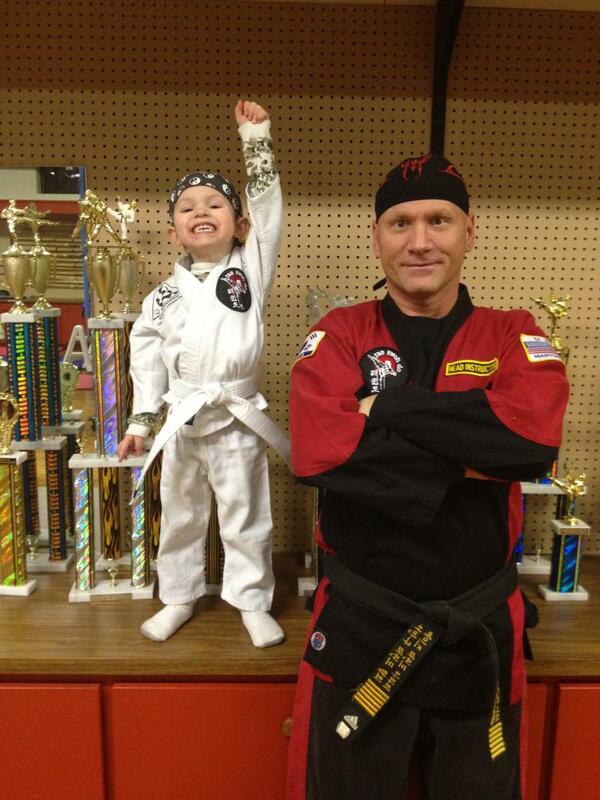 (Shown also is his 3 yr old son, Avery Olewiler) after earning his 1st stripe on his white belt, Jan 17, 2014. 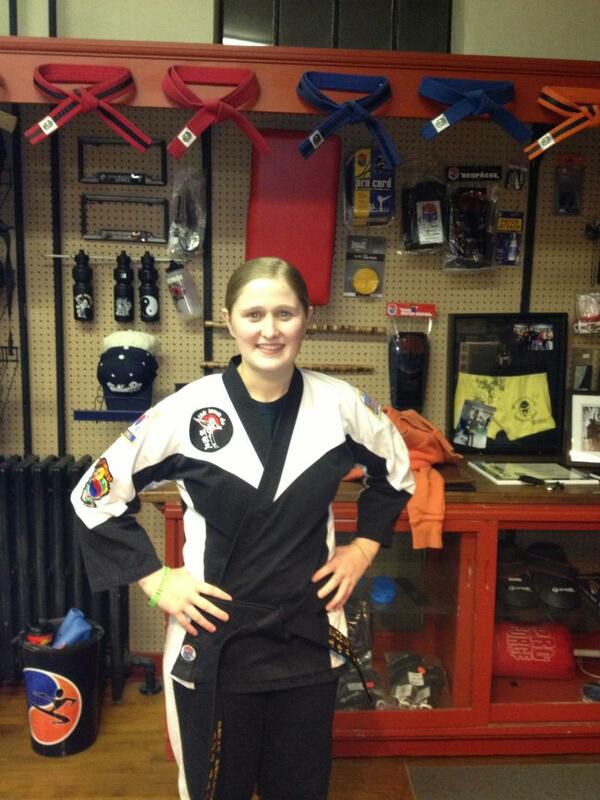 Bailey Anderson : 2nd Dan Degree Black Belt in Tae-Kwon-Do, Assistant Instructor. December 2014. MACE Martial Arts Academy: Has various Guest Instructors and Competitors teach classes at our academy on a regular basis, thus making the classes very diverse which helps keep our fight team fresh with new fighting concepts.